Ann's hometown is Des Moines, Iowa, but after being a north Minneapolis resident for almost 18 years and living in the Twin Cities region for 24 years, it is safe to say that she considers Minneapolis a place to call "home." 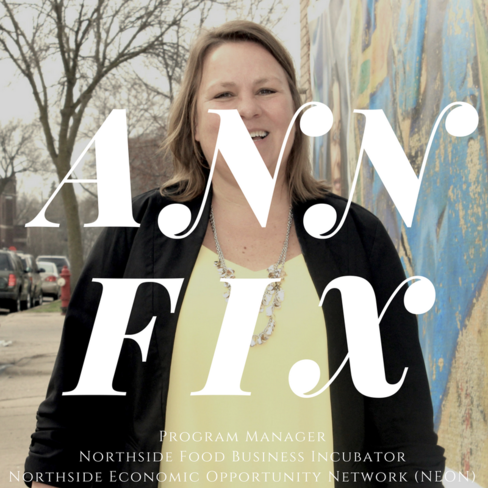 Ann is the current Program Manager at the Northside Economic Opportunity Network (NEON) for their recently established Northside Food Business Incubator program. Her experience as a previous business owner in addition to her active engagement surround local food makes her a great candidate to encourage, help and guide northside entrepreneurs in this field. Ann's journey in the "foodie world" and passion for local food emerged when she lived in mainland China with her husband, who is originally from Wuhan, China and her daughter CC. "My in-laws still shopped traditionally. Every morning we would get up and go to this little, partially indoor, partially outdoor market. It's what we would think of as a farmers market. All of the vendors were there - the spice lady was there, the tofu lady was there, the chicken guy, the fish guy - everyone was there! CC and I love it... Everyday we wanted to take this market home with us. It's on of the things we missed the most when we can back." The encouragement of her husband was the push Ann needed in 2008 to take a leap of faith and stat Local D'Lish, "a food store focused on local farmers, local food artisans - just everything local." 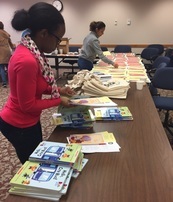 On April 14th and 21st, several of the MPZ AmeriCorps VISTAs and City employees worked together to put a variety of information, along with a board book into a sturdy tote bag for parents of newborns. They began assembling 500 tote bags with supplies in Spanish and went on to put together an additional 1500 bags with supplies in English. The purpose of the tote bags was for Mayor Betsy Hodges' Cradle to K initiative. This piece was coined as the Talking is Teaching campaign. The idea is that the information in the totes will encourage the parents of young children to begin talking to their little ones in order to expand educational opportunity and kindergarten readiness. It has been proven that the children that are spoken to often and early in their lives are more likely to be ready for the beginning steps of reading. Thousands of Prince fans are in the Twin Cities to honor the music legend. It has been almost a year since Prince died at his Paisley Park Studios and home in Chanhassen, but that's not the only stop for Prince fans. Many have been taking in all the sights that have a connection to the Minnesota native. Reduced federal spending on housing would affect constituencies as diverse as working families, seniors and people with disabilities, and those with criminal histories. Arthur noted that the challenge goes well beyond the Trump administration. It's the latest of more than 30 years of unfavorable moves on housing from the federal government under both Republican and Democratic administrations, he said. Federal housing programs have seen a sharp decline in funding over the years even as rents and building costs rise. It was an unforgettable day for some local children in north Minneapolis: not only did they get a brand-new place to play tennis, one of the game's greatest coaches was there to give some instruction. From Serena Williams to Andre Agassi, Nick Bolletteri has coached some of the best tennis player sin the world. Twins Allie and Alexx Hopkins are valedictorian and salutatorian of their North High School senior class. In the fall, Allie will go to the University of Minnesota and Alexx will go to St. Cloud. The Southwest light-rail line was allocated $10 million in the temporary federal budget being considered by lawmakers in Washington - news that the Metropolitan Council says is a sign the project will win its full $928 million grant from the Federal Transit Administration (FTA) later this year. VGF grants will be used to develop and/or support community-based entities to recruit, manage, and support volunteers. CNCS seeks to fund effective approaches that expand volunteering, strengthen the capacity of volunteer connector organizations to recruit and retain skill-based volunteers, and develop strategies to use volunteers effectively to solve problems. Specifically, the VGF grants will support efforts that expand the capacity of volunteer connector organizations to recruit, manage, support and retain individuals to serve in high quality volunteer assignments. Applicants that receive funding under this Notice may directly carry out the activities supported under the award, or may carry out the activities by making subgrants to community-based entities, supporting volunteer generation at these entities. The Federal Motor Carrier Safety Administration (FMCSA) announces the Fiscal Year (FY) 2017 CMVOST grant program Notice of Funding Availability (NOFA) to solicit applications from organizations that provide CMV operator training, including accredited public or private colleges, universities, vocational-technical schools, post-secondary educational institutions, truck driver training schools, associations, and State and local governments, including Federally-recognized Native American Tribal governments that support CMVOST activities. EPA’s Office of Transportation and Air Quality is soliciting proposals nationwide for projects that achieve significant reductions in diesel emissions in terms of tons of pollution produced by diesel engines and diesel emissions exposure, particularly from fleets operating at or servicing goods movement facilities located in areas designated as having poor air quality. Further, priority for funding may be given to projects which result in outcomes that benefit affected communities, those that engage affected communities with respect to the design and performance of the project, and those which can demonstrate the ability to promote and continue efforts to reduce emissions after the project has ended. Cyberspace has transformed the daily lives of people. The rush to embrace cyberspace, however, has exposed its fragility and vulnerabilities: corporations, agencies, national infrastructure and individuals have been victims of cyber-attacks. In December 2011, the National Science and Technology Council with the cooperation of NSF advanced a broad, coordinated Federal strategic plan for cybersecurity research and education to "change the game," examine the misuses of cyber technology, bolster education and training in cybersecurity, establish a science of cybersecurity, and transition promising cybersecurity research into practice. To achieve this strategic plan, the Nation requires an innovative and efficient cybersecurity education system that results in an unrivaled cybersecurity workforce and citizenry capable of advancing America's economic prosperity and national security in the 21st century. The Cybersecurity Enhancement Act of 2014 (Public Law 113-274) authorizes the National Science Foundation, in coordination with the Office of Personnel Management and the Department of Homeland Security, to offer a scholarship program to recruit and train the next generation of information technology professionals, industry control system security professionals and security managers. The CyberCorps(R): Scholarship for Service (SFS) program seeks proposals that address cybersecurity education and workforce development. The Scholarship Track provides funding to award scholarships to students in cybersecurity. All scholarship recipients must work after graduation for a Federal, State, Local, or Tribal Government organization in a position related to cybersecurity for a period equal to the length of the scholarship. A proposing institution must provide clearly documented evidence of a strong existing academic program in cybersecurity. In FY 2017, the National Institute of Food and Agriculture (NIFA) requests applications for the AFRI’s Food, Agriculture, Natural Resources and Human Sciences Education and Literacy Initiative (ELI) to support:(1) professional development opportunities for K-14 teachers and education professionals; (2) training of undergraduate students in research and extension; and (3) fellowships for predoctoral and postdoctoral candidates. In FY 2017, the Food Safety Outreach Program will focus on delivery of customized training to members of the target audiences. New projects will focus on, but are not limited to, addressing knowledge and resource gaps for the target audience in the areas of pre- and post-harvest water testing and sampling, soil amendments, developing supply chain programs, and/or developing food safety plans. The program will continue to fund projects that develop bilingual and culturally appropriate training resources. The purpose of this grant competition is to support efforts by State agencies and their community-based and faith-based partners to develop and implement: Simple SNAP application and eligibility determination systems; or§ Measures to improve access to SNAP benefits by eligible applicants. This RFA seeks diverse proposals that would make the entire process easier and more efficient for SNAP applicants and participants. Grant proposals should focus on improving the quality and efficiency of operations and processes within the SNAP office. Specifically, FNS is interested in initiatives that use new technologies or examine office processes in order to improve application processing timeliness for initial or recertification applications. We encourage potential applicants to carefully read the three review criteria listed in the RFA. These criteria outline the qualities FNS expects successful proposals to have; they will also guide the reviewers’ evaluation of proposals. CDC seeks to fund organizations with the ability to reach undergraduate and graduate students, including sexual and gender, people with disabilities, low socioeconomic status (SES) and those from underrepresented racial and ethnic minority populations. The ultimate goal is to increase the diversity of the public health workforce, improve the representation of underrepresented populations in public health, and increase the quality of public health services nationally. The Administration for Children in Families (ACF), Office of Trafficking in Persons (OTIP) is announcing funds for the Look Beneath the Surface Regional Anti-Trafficking (LBS) Program. The LBS Program will serve as a focal point in targeted geographic areas and focus on the identification and referral of foreign and/or domestic victims of severe forms of trafficking in persons as defined by the Trafficking Victims Protection Act of 2000.Victim identification activities under the LBS Program include direct outreach to victims, anti-trafficking training and outreach to local professionals and organizations or entities that may encounter victims of trafficking, active participation in a strong multidisciplinary anti-trafficking coalition or task force, and strategic public awareness activities. The Centers for Disease Control and Prevention (CDC) announces the availability of Fiscal Year (FY) 2017 funds for a cooperative agreement with organizations with demonstrated experience and capacity of implementing community engagement methods (e.g. community-based participatory research) and multi-sector partnerships to promote personal health, advance community wellness, influence health behavior and practices, and reduce STI disparities. The Administration for Children and Families (ACF), Office of Planning, Research, and Evaluation (OPRE) is soliciting applications for Behavioral Interventions Scholars grants to support dissertation research by advanced graduate students who are using behavioral science approaches to examine specific research questions of relevance to social service programs and policies. These grants are meant to build capacity in the research field to apply a behavioral lens to issues facing poor and vulnerable families in the United States, and to foster mentoring relationships between faculty members and high-quality doctoral students. Applicants are required to demonstrate the applicability of their research to practice or policy serving low-income children, adults, and families, especially those that seek to improve their well-being. Specific topics of interest will be delineated in the full funding opportunity announcement. This FOA, formerly HHS-2017-ACF-OPRE-PD-1209 will now be listed under HHS-2017-ACF-OPRE-PR-1209.The Administration for Children and Families (ACF), Office of Planning, Research and Evaluation (OPRE), will solicit applications for Family Strengthening Scholars grants to support dissertation research on healthy marriage policy issues. These grants are meant to build capacity in the research field to focus research on questions that have direct implications for healthy marriage policy decision-making and program administration, and to foster mentoring relationships between faculty members and high-quality doctoral students. These grants are intended to address issues of significance to inform policy decisions and solutions, particularly for underserved/understudied populations (e.g., low-income families, minority populations), utilize rigorous research methodology (both primary data collection and secondary data analysis), and help inform the development of future intervention research. The purpose of this forecasted funding opportunity announcement (FOA) is to provide competitive grant funds for up to 5 years for projects authorized by the Child and Family Services Improvement and Innovation Act (Pub. L. 112-34). This Act includes a targeted grants program (section 437(f)) that directs the Secretary of Health and Human Services to reserve funds for regional partnership grants (RPGs) to improve the well-being of children affected by substance abuse. These targeted grants will be awarded to regional partnerships that provide, through interagency collaboration and integration of programs and services, activities and services that are designed to increase the well-being of, improve permanency outcomes for, and enhance the safety of children who are in out-of-home placements or are at risk of entering out-of-home placements as a result of a parent's or caretaker's substance abuse. In September, 2000, the Pew Environmental Health Commission issued a report entitled America’s Environmental Health Gap: Why the Country Needs a Nationwide Health Tracking Network. In this report, the Commission documented that the existing environmental health systems were inadequate and fragmented and recommended a Nationwide Health Tracking Network for disease and exposures. In response to the report, Congress appropriated funds in the fiscal year 2002s budget for the CDC to establish National Environmental Public Health Tracking Program (Tracking Program) and Network and has appropriated funds each year thereafter to continue this effort. Environmental Public Health Tracking (Tracking) is the integrated surveillance of health, exposure, and hazard information and data from a variety of national, state, and local sources. The Tracking Network is unique in that it provides the United States with accurate and timely standardized data and supports ongoing efforts within the public health and environmental sectors to improve data collection, accessibility, and dissemination as well as analytic and response capacity. This funding opportunity announcement seeks to encourage researchers to partner with communities using Community Engaged Research (CEnR) methodologies that will enhance relationships leading to better interventions and positive health outcomes. See similar announcement and R activity codes note above. This Funding Opportunity Announcement (FOA) seeks to encourage applications that employ innovative research to identify mechanisms of influence and/or promote positive sustainable health behavior(s) in children and youth (birth to age 21). Applications to promote positive health behavior(s) should target social and cultural factors, including, but not limited to: schools, families, communities, population, food industry, age-appropriate learning tools and games, social media, social networking, technology and mass media. Topics to be addressed in this announcement include: effective, sustainable processes for influencing young people to make healthy behavior choices; identification of the appropriate stage of influence for learning sustainable lifelong health behaviors; the role of technology and new media in promoting healthy behavior; identification of factors that support healthy behavior development in vulnerable populations, identification of barriers to healthy behaviors; and, identification of mechanisms and mediators that are common to the development of a range of habitual health behaviors. Given the many factors involved in developing sustainable health behaviors, applications from multidisciplinary teams are strongly encouraged. The ultimate goal of this FOA is to promote research that identifies and enhances processes that promote sustainable positive behavior or changes social and cultural norms that influence health and future health behaviors. The purpose of this funding opportunity announcement is to stimulate research to examine the relationship between asthma, obesity and self-management. The prevalence of both asthma and obesity has significantly risen in the past few decades. Although the association between these two conditions has been found in many studies, the exact mechanisms for how this association arises are unresolved to include self-management and achieving control. Because both of these conditions have their beginnings in early life, an aspect of the association between them that requires more understanding is their common exposures in early life and transition into adulthood. Studies that investigate the molecular pathways linking asthma and obesity are encouraged as long as the studies describe how this relates to self-management. In addition, intervention studies targeting asthma or obesity and their effects on each other, and possible mechanisms of action and effect on behavior, are encouraged. This funding opportunity announcement seeks to build the science of family-centered self-management (FCSM) in chronic conditions. The purpose of this Funding Opportunity Announcement (FOA) is to encourage research applications to develop and test the effectiveness and implementation of family navigator models designed to promote early access, engagement and coordination of mental health treatment and services for children and adolescents who are experiencing early symptoms of mental health problems. For the purposes of this FOA, NIMH defines a family navigator model as a health care professional or paraprofessional whose role is to deploy a set of strategies designed to rapidly engage youth and families in needed treatment and services, work closely with the family and other involved treatment and service providers to optimize care and monitor the trajectory of mental health symptoms and outcomes over time. Applicants are encouraged to develop and test the navigator models ability to promote early access, engagement and coordination of mental health treatment and services for children and adolescents as soon as symptoms are detected. Of interest are navigator models that coordinate needed care strategies, determine the personalized match to the level of needed service amount, frequency and intensity, and harness novel technologies to track and monitor the trajectory of clinical, functional and behavioral progress toward achieving intended services outcomes. Each funding opportunity description is a synopsis of information in the Federal Register application notice. For specific information about eligibility, please see the official application notice. The official version of this document is the document published in the Federal Register. Free Internet access to the official edition of the Federal Register and the Code of Federal Regulations is available on GPO Access at: http://www.access.gpo.gov/nara/index.html. Please review the official application notice for pre-application and application requirements, application submission information, performance measures, priorities and program contact information. Purpose of Program: The purposes of the Educational Technology, Media, and Materials for Individuals with Disabilities Program are to: (1) Improve results for students with disabilities by promoting the development, demonstration, and use of technology; (2) support educational activities designed to be of educational value in the classroom for students with disabilities; (3) provide support for captioning and video description that is appropriate for use in the classroom; and (4) provide accessible educational materials to students with disabilities in a timely manner. Note: Each funding opportunity description is a synopsis of information in the Federal Register application notice. For specific information about eligibility, please see the official application notice. The official version of this document is the document published in the Federal Register. Free Internet access to the official edition of the Federal Register and the Code of Federal Regulations is available on GPO Access at: http://www.access.gpo.gov/nara/index.html. Please review the official application notice for pre-application and application requirements, application submission information, performance measures, priorities and program contact information. Purpose of Program: The purposes of this program are to: (1) Help address State-identified needs for personnel preparation in special education, early intervention, related services, and regular education to work with children, including infants and toddlers, with disabilities; and (2) ensure that those personnel have the necessary skills and knowledge, derived from practices that have been determined through scientifically based research and experience, to be successful in serving those children. Note: Each funding opportunity description is a synopsis of information in the Federal Register application notice. For specific information about eligibility, please see the official application notice. The official version of this document is the document published in the Federal Register. Free Internet access to the official edition of the Federal Register and the Code of Federal Regulations is available on GPO Access at: http://www.access.gpo.gov/nara/index.html. Please review the official application notice for pre-application and application requirements, application submission information, performance measures, priorities and program contact information. Purpose of Program: The purpose of the Technical Assistance and Dissemination to Improve Services and Results for Children with Disabilities program is to promote academic achievement and to improve results for children with disabilities by providing technical assistance (TA), supporting model demonstration projects, disseminating useful information, and implementing activities that are supported by scientifically based research. The deliverables from this cooperative agreement will contribute to the mission of NIC by promoting the ongoing development and advancement of correctional practices by developing a standardized approach to performance and outcome measurement for the community corrections (local and state probation) field. Accurate and detailed documentation of case information, along with a formal and valid mechanism for measuring outcomes, is the foundation of evidence-based practice. Evidence-based practice implies that 1) one outcome is desired over others; 2) it is measurable; and 3) it is defined according to practical realities (i.e. public safety) rather than immeasurable moral or value-oriented standards. As suggested in The Pew Center Public Safety Performance Project- “Policy Framework to Strengthen Community Corrections”, community corrections agencies should implement a systemic performance measurement model, which includes measures of outcomes in key performance areas to provide regular objective and quantitative feedback on how well agencies are achieving their goals. We need to measure strategies and activities that reduce offender risk factors that diminish the likelihood of re-offending, support and develop protective risk factors and those activities that hold offenders accountable.